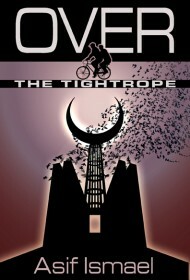 Over the Tightrope, by Asif Ismael, is a spiritual adventure story borrowing tropes from magical realism, speculative fiction, and urban fantasy. Twelve years after escaping his Muslim upbringing in Pakistan, Ismael is a doctoral student in New York, specialized in refuting the notion of spiritual worlds such as the Islamic concept of paradise. But his childhood has left him scarred, and at the suggestion of another student, he engages in New Age therapies to find wholeness. What Ismael finds, instead, is an invitation to a journey that will return him to a Pakistan transformed by fundamentalism, face-to-face with a father at the center of the regime, and in an otherworldly alliance with spiritual beings who have their own plans for his prodigal return. Over the Tightrope weaves together several themes. It is about the estrangement of a son from his father, and the tension of someone escaping a devout upbringing but unsatisfied by his own newfound skepticism. It is a fantasy adventure that takes its narrator literally to hell and back on no less a mission than to save the world from destruction. And it is a smart satire of theocracy, showing us a society where suicide bomber vests are sold in gift shops and individual acts of terrorism are a moral imperative. Author Asif Ismael uses Islamic mythology to craft a plot compelling to readers of any background, but Over the Tightrope’s characters fall short. Women only exist to fulfill male desires, and there are lengthy, explicit passages describing Ismael’s sexual escapades. Although the psychological tension in Ismael (and between him and his father) is interesting, he fails to mature much over the course of the book, despite his experiences. Too often the fascinating ideas presented here get lost in a juvenile male fantasy. That said, readers willing to overlook this flaw will find an exciting story with a wealth of provocative thoughts.